Today, Connolly's Crew is taking over the Tumwater LIMEberry! 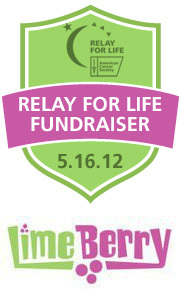 A portion of ALL sales from today, Wednesday, May 16, will be donated to our Relay For Life team. LIMEberry is an incredible supporter of our community, and they have the best froyo around! Thomas is always in heaven because he can mix and match to his heart's content, and he doesn't have to share with John Paul. I'm super pumped because this is the first fundraiser of our newest team member, Tori Fairhurst, and I am feeling so blessed to not only Relay alongside her, but to be able to call her friend. It's one of the awesome things about Relay...you never know what amazing blessings will be brought into your life! It's such a small world...not only did she grow up with one of Jonathan and my's favorite priests, Fr. Sean Raftis, but she was also friends with Mary Ski, Jonathan's mom. The Wee Skis will be there this afternoon in full force, proudly sporting their grand club tees. We'll have a spot for you to make luminaria at LIMEberry, and to be celebrate, remember and fight back as we prepare for Relay For Life in June!